Heather McGeehan, University of the Arts; Philadanco II, Vivid Motion, Konservatoriet Dance Ensemble, Onda Latina, Samba Nosso, UArts African Ensemble, Performance Dance Theater. “The show was just beautiful and was a wonderful mix of dance. My family really enjoyed themselves and I was so happy to be a part of all the fun. Thank you for teaching us another beautiful dance and for all your patience and time that you gave to us. Your show was a wonderful expression of yourself and a lovely way to share world dance with so many others. Thank you for sharing your love of dance with all of us dancers and with your whole audience.” ~ Terri M.
April 28th, 2007 Warminster, Pa.
“WOW!” That’s what was going through my head on April 28th, 2007. I have seen many Bellydance shows over the 9 years that I’ve been dancing, and I can tell you that Lurainya’s show was one of the best! Her organization was impressive, her attention to detail was impeccable, and her creativity amazed me. If this was just a “glimpse” into the world of Bellydance Fusion as Lurainya envisions it, then I can’t wait to see what she does next! Overall, this was a night of wonderful entertainment. This was so much more than a “student recital” or “hafla” — it was a Production! The show was held at the Warminster Recreation Center and its theatre-like set up proved to be the perfect venue for the launch/preview of Lurainya’s dance-theatre production: REALM. Doors opened at 6pm, and by 5:45pm there was a long line all the way down the sidewalk! The show was sold out, with 250 people in attendance. The mystical mood was set as soon as one entered the room: Lighting along the walls/entryways; a spacious and raised stage with dramatic lighting and a great sound system; ten vendors displaying a wonderful array of products; two large tables offering different styles of delicious food, desserts and beverages; plus a raffle table where for $1 you could win prizes ranging in value from $60 to $140! Adding to the excitement were four cameras documenting the event, including a behind the scenes camera, which I can’t wait to see. The volunteers on staff that night were well informed of their responsibilities, carrying through with proficiency and adding to the professional quality of the event. Part One of the evening consisted of student performances – which did not disappoint! They were fantastic – and a true testament to Lurainya’s teaching abilities! Especially when you find out that many had been dancing for less than 16weeks, and there they were, on stage in front of hundreds of people – dancing well! Others had been with Lurainya for 1-3 years, exuding control and confidence.I was very impressed with Lurainya’s choreographies – not only was she able to choreograph for so many different styles and experience levels, but each was very creative and entertaining to watch!The two beginner groups were jam-packed with Bellydance moves; one using flowing veils, the other an exciting drum solo which incorporated a “dance off” like no other! There was an adorable intermediate Sharqi duet to Amr Diab’s “Mrkafesh”, and a wonderfully artistic sword duet to U2’s “Mysterious Ways”. The three advanced solos also varied in style – one using veil, another zills, and another dancing to “Back in Black” from AC/DC. They portrayed a mastery of movement that not all members of the bellydance community have yet to achieve. It’s obvious that Lurainya expects a lot from her students who choose to perform, but it’s also obvious that she makes sure they have the tools to deliver. Lurainya’s solo concluded the student portion of the show. Dripping in white cabaret costuming, she made her entrance with a mysterious taxim, peering out from under her veil, which was wrapped in such a unique way that I couldn’t tell where it began or ended! Following her moving veil piece, she ended with a high-powered Tahitian flavored drum solo. Part Two of the evening was an incredible professional lineup. 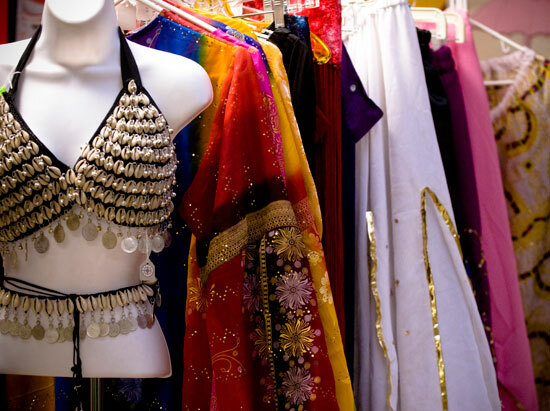 Not only were different styles of Bellydance represented, but also Bharata Natyam and Flamenco. 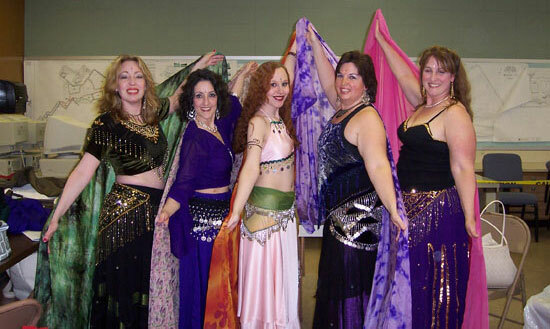 Hayet danced traditional Sharqi to the classical favorite of “Azziza”. Her articulations and playfulness were true to Egypt. 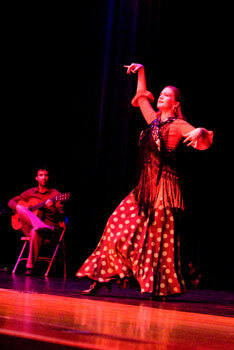 Alexia performed a powerful Turkish Rom piece, incorporating traditional Romany gestures. I think the audience wanted to clap, but they weren’t sure what to do with a rhythm so foreign to their ears! Hipnosis performed an ATS duet beginning with an upbeat fusion choreography followed by a hypnotic ‘lead and follow’ piece. Shaily Dadiala performed a beautiful Bharata Natyam (Classical Indian) piece depicting a mother going about her daily routine of chores, while keeping a watchful eye on her children. Pasion y Arte performed a modern Flamenco duet. One in lyrical dress and one in traditional Flamenco dress, they let their bodies talk to each other through the dance. It was time for Part Three of the evening, the REALM preview! I’ve heard a lot about this dance-theater production over the last year, so I was excited to finally see some of it! The anticipation was building as an announcement was made that a fog machine would be used, in case anyone had asthma (like I said, Lurainya’s attention to detail was impeccable). The lights went dark, the stage started to fill with fog, and then the music began. The eerie sound pulled the audience in as they waited to see the figures positioned in the fog. The lights slowly faded in as the intensity of the music grew. We could see 6 figures, two glowing in white with feathered headpieces, and 4 in dark, ragged costuming with dreadlocks and tattoos all over their bodies! How Lurainya went from a glamorous cabaret costume to having dreads in her hair and big tattoos on her thigh, arm and stomach, I’ll never know, but it was a remarkable transformation! The choreography that ensued was like nothing I’ve ever seen. It was a combination of modern and ballet, with fleeting hints of Bellydance, Indian and African. Lurainya’s innovative composition told the story of the “struggle, strength and sensuality within everyone woman”. The dancers moved with precision and power. I was left feeling inspired and in awe! You can be sure that after seeing this preview I will be anxiously awaiting the full debut of REALM! Lurainya is bringing to the belly-dance world what Riverdance has brought to Irish dancing — passion, vision, talent, creativity and mastery. She’s a one-woman force — choreographing, teaching, performing, producing and directing. Watch for Lurainya in the future… I promise, you won’t be disappointed! I had a wonderful evening at Lurainya’s World Dance Show – it was truly one of the most well-put together and well orchestrated shows that I have attended in some time. Held in Warminster, it took place in the Warminster Recreation Center, which was a perfect place for the event. The rec center had a spacious room set up with a stage, lighting, sound, and plenty of room for seats, vendors, and food. There were several vendors there, with a wide range of services and products, and the refreshment table included lots of delicious Middle Eastern food. It was very popular, with long lines whenever it was open. First, I would like to commend Lurainya and those assisting her for keeping very close to their proposed time schedule – the event began promptly and, even though it ended a bit later than planned, it still ended at a reasonable time. I really appreciate this – I’ve been at a lot of dance events lately where they have begun hours (literally) late and ended late into the night. For a show that has a family audience and many children in attendance (like this one), I could tell that everyone appreciated the schedule. The audience was filled with lots children and adults who were experiencing belly dance for the first time. 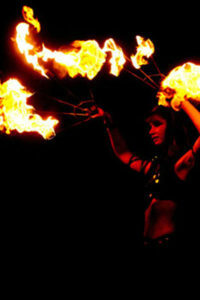 Everyone had a lot of fun and it was so great to see audience members entranced by the performers. The audience was a bit quiet, which is pretty usual for first time audiences, and I think it would have been very helpful to have an introduction to the show. Perhaps a quick welcome from someone close to the event and an explanation about audience participation (We like it when you clap in time to the music! Hoot and holler when you feel like it! Hiss or say “Aiwa!”) might have put a few audience members at ease. The gentleman a few seats away from me almost fell off his when I let out my first loud zaghareet! The first part of the show was performed by Lurainya’s students, from beginners to advanced. I really enjoyed the wide range of performances – there was a veil number, a sword duet to U2’s “Mysterious Ways,” a drum solo, a sharqi duet, a fusion piece, a solo with veil, and a nontraditional numer to AC/DC’s “Back in Black.” Lurainya closed the first part of the show with a fusion veil and drum solo. I was very impressed with Lurainya’s students, especially when reading the comprehensive program that included their bios and how long they have been taking lessons. Many of Lurainya’s beginners had taken 2 – 4 eight-week sessions or less, and they were on stage, in costume, performing! And they were excellent! I also really enjoyed their costuming – costuming for beginners and first shows can be very tough and everyone looked great, well put together, and comfortable. Lurainya’s intermediate and advanced students were wonderful as well during their solos. The energy was very upbeat and positive for the first part of the show. A lovely touch came at the end of the first half, where Lurainya brought her students back onto the stage and presented each with a rose as thanks for their hard work. The second half of the evening was dedicated to professional dancers from the area. Performers included Hayet, doing traditional raqs sharqi; Alexia performing Turkish Rom; Hipnosis doing American Tribal; Shaily Dadiala performing Bharata Natyam (classical Indian dance); and Flamenco performed by Pasion y Arte. Every performer listed above is a master of her dance genre, so it was very exciting to see such a collection of talent on one stage. It was also a nice juxtaposition of different dance styles, and one could easily see the influence each dance has on belly dance. 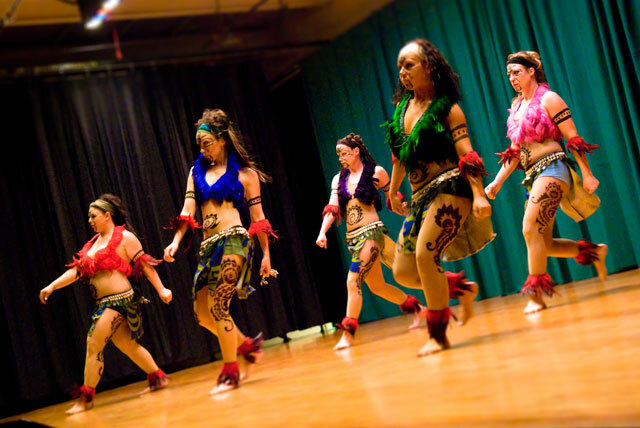 In my opinion, including professional dancers in a variety of dance styles really elevated this show above a typical hafla or student recital – it was truly a SHOW, bringing together all levels of dancers with a variety of dance backgrounds. By breaking the show into two parts and by presenting a variety of performances and dance styles, the night seemed to fly by and it helped keep the audience engaged and excited. The night ended with a preview of Lurainya’s latest project, and quite the labor of love – REALM. 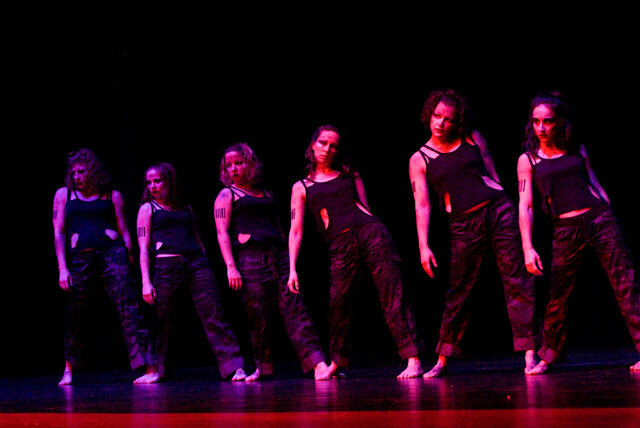 REALM is the title for Lurainya’s dance-theater production about women and world dance which is currently tentatively scheduled to premier in Spring 2008. The short piece was riveting. Definitely more modern dance/world dance than straight belly dance, it was entrancing and original. The piece was very powerful and it had an aura of Cirque du Soleil type characterization, with gothic undertones and impressive athleticism (such as the coordinated handsprings). I’m not the best at describing dance performances, and would not do the performance justice by trying to describe it, but I can say that this preview was wholy original and I look forward to seeing Lurainya’s vision unfold in the complete production. Overall, I had a wonderful evening – I am still processing the music and the performances, mulling them over and incorporating them into my dance knowledge – which is a great sign that I enjoyed the show. I felt that the show appealed to every level of audience member – it gave me, a more experienced dancer, a lot to think about and take away. It was entertaining for family and friends of the performers, and it gave Lurainya’s students, as well as the professional performers, much to absorb as well. Congratulations and thank you to Lurainya, her volunteers, her students, the vendors, and the professional performers for a memorable night!